The leaders of two of Derry’s main churches have jointly described the attempted murder of a police officer in the city this morning as appalling. 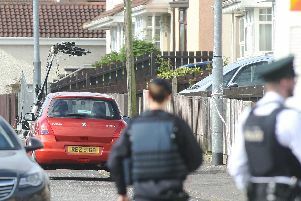 The Bishop of Derry, Donal McKeown, and the Bishop of Derry and Raphoe, Ken Good, said the incident showed a callous disregard for the lives not only of the officer who was targeted but of the officer’s neighbours in Culmore. In a joint statement the Bishops said: “We are appalled at this latest attempt to murder a PSNI officer in our city and relieved that the attack did not succeed. “There can never be any justification for such a crime. It was wrong. It was evil. And it showed a callous disregard for the lives not only of the police officer targeted by the bombers but of the officer’s neighbours too. “Today’s incident also shows a blatant disregard for the people of this city who have expressed their desire – repeatedly and overwhelmingly – for an end to violence. This attempted murder is, therefore, an attack on all of us. “Our people want to move forward – together – to a better and brighter future. The bombers seem intent on taking us backwards and keeping us apart. They must not succeed.